Presentation Control - is a tiny yet powerful Android application that allows you to easily remotely control Powerpoint, OpenOffice, Adobe PDF presentations on a PC from Android Phone or Tablet. Communication is done via WiFi network. 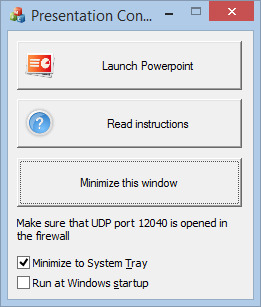 If the program does not work, plase make sure that Firewall is not bocking UDP port 12040.